, Reserved parking and free WI-FI. The apartments have a common area barbecue for excellent grilled fresh fish that you find every day in our port of Sciacca, you can watch our fishing vessels directly from your deck at night enjoying a sparkling sea full of little lights. For smaller, waterfront we expected a small playground. Cet appartement bien équipé, est situé dans une petite baie enchanteresque ! Nous avons apprécié le confort de la résidence: parking privé ombragé, pédalo à disposition, hamacs et fauteuils sur la plage. Sciacca est une jolie ville, située à moins d'une heure d'Agrigente pour la visite de la vallée des Temples. Nous y reviendrions avec beaucoup de plaisir ! Die Wohnung übertraf unsere Erwartung toller Ausblick ruhige Lage und gut ausgestattet. Der Vermieter sehr hilfsbereit, nicht aufdringlich, selbst beim bezahlen eines Strafzettels wegen Falschparken war er uns behilflich. Diesen Vermieter und die Ferienwohnung kann ich nur bestens weiterempfehlen. Just 50 meters from the beach, 5 km from Sciacca, a charming spa town with its Moorish palaces and Norman, with small ceramic workshops and typical products and restaurants where to eat good fresh fish. 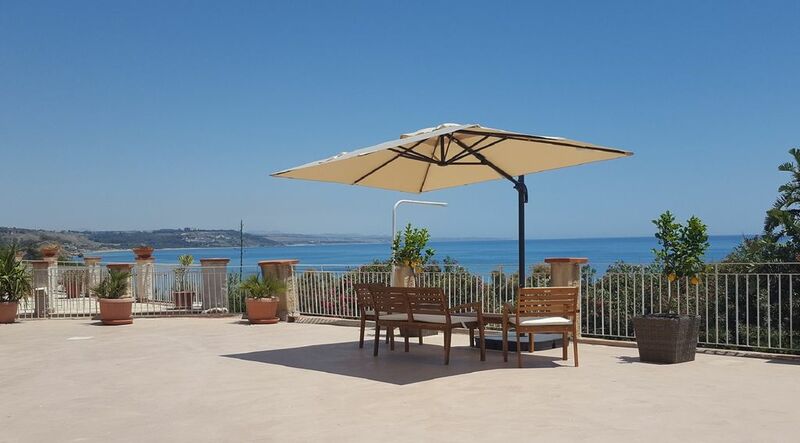 Sciacca is located in a strategic position to visit the most important sites of Sicily, just 40 km from the Valley of Temples in Agrigento, 100 km from Palermo and 30 km from Selinunte. We could also help you to organize your trip and think about the car and scooter rental service, transfer, air ticketing and naval, hiking and boat trips. Sciacca beautiful town overlooking the Mediterranean Sea in the south west coast of Sicily, between the Valley of the Temples in Agrigento and the Selinunte archaeological park. The town of Sciacca offers a number of cultural and historical insights of great importance. The origins of Sciacca are ancient, probably during the Sicani or the Phoenicians. In VII. C., according to Thucydides, the inhabitants of Selinunte had built, as the boundary of their territory, a castle that was named Terme Selinuntine. The springs and mineral mud of Sciacca, considered among the most effective in the world, attract a growing presence of scholars, patients and visitors. It 'a Spa of great relevance which is cleverly structured to accommodate those who go looking for health and relaxation. At the Baths of Sciacca Regional they are in operation all year round the Cure Thermal Department and the Department of Physio-kinesitherapy. The practice therapeutic techniques, are the result of the high level of technological progress achieved in the field of exploitation of mineral waters and each possess accurate information and specific therapeutic characteristics. All the treatments are covered by the National Health Service through which you can get a cycle of thermal treatments every year or several cycles of rehabilitative care in the opinion of the treating physician. Under the beautiful blue sky of the city of Sciacca, with the view of a sea and a beautiful landscape, playing a round of golf becomes an unforgettable experience. The fantastic golf courses have been designed by renowned golf architect Kyle Phillips, and blend in harmony with the nature of the beautiful Sicilian landscape. There are two championship 18-hole courses and a 9-hole golf course, all by olive and orange groves and with lovely views of the azure of the Mediterranean Sea. The golf courses attract the interest of beginners and the most passionate professionals. Every day an 18-hole course is dedicated to the two-ball game and the other to the four-ball game. The driving range is with double-hitter and every hitter tees are positioned at 80 yards, creating the perfect conditions for practice. There are also putting greens, chipping greens and several bunkers. Qualified PGA professionals are available for private lessons. Sicily, an island in a sea of ​​light, Queen of the Mediterranean, an immense cauldron of emotions, colors and flavors, rich in history and myth. For its startegica position in the Mediterranean, it has always been a land of conquest and crossroads of cilviltà, place of meeting and clash of many cultures that have left, over the centuries, precious signs of their presence. The continuous alternation of domains and populations, with their different cultures, artistic and architectural expressions have enriched our land for a legacy of immeasurable value. These peoples have marked the spirit and character of the Sicilians, eternal guardians of cultures and traditions that are relived every day in the gestures, in the singularity of expression, and religious and popular events that make up a unique folklore, full of color and joy of making life even more pleasant stay in Sicily. But Sicily is above all a land of natural beauty, as the happy marriage between a crystal clear sea with its pristine beaches and a prosperous and generous country, where you can go from the beautiful sandy shores to the heights of Etna, the highest volcano ' Europe, through ancient villages, parks and nature reserves, sanctuaries and stone churches, medieval castles, beams and farms. Our island is definitely the most suitable place for tourists who approaches nature and its rhythms, which wants to know the genuineness of the products of the earth and the sea, from which comes a delicious combination of food and wine, sometimes sumptuous and simple times, but always genuine and varied in a thousand shades. Sicily island in the sun, is a land of 3. 000 years of history and art, stories and mythology, human warmth, contrasting colors and a beautiful nature. Vi informiamo che il check-point si trova presso l'Agenzia Gulliver, Corso Vittorio Emanuele 9, 92019 Sciacca. Check-in dalle ore 16:00 alle ore 20:00 Check-out entro le ore 10:00. Siete pregati di contattarci per confermare l'orario di arrivo previsto. Per check-in fuori orario, contattarci in anticipo per concordare la consegna delle chiavi.